"This is a simple way to prepare tasty wild salmon!" Rinse the salmon fillets and pat dry thoroughly with paper towels; season with sea salt. Gently lay the salmon into the hot oil with the skin side facing up and cook until the the flesh side is golden brown, 5 to 7 minutes; turn and continue cooking until the skin side is slightly browned, about 5 minutes more. Remove the salmon from the skillet, allowing any oil to drain from the fish back into the pan. 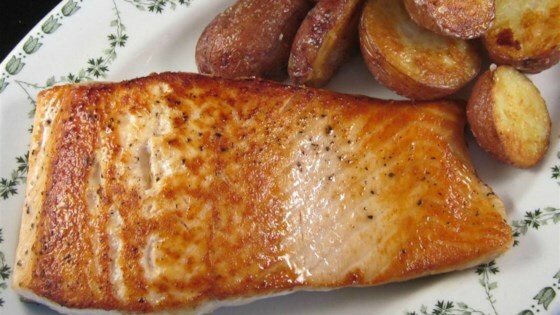 Remove the skin from the salmon fillets; fry the skin in the oil remaining in the skillet until crispy, 2 to 3 minutes. Serve the crispy skin with the salmon. Pan frying on flesh side for 5 to 7 minutes way too long. Just watch it and turn several times! Can't get any simpler than this. It works. It's straight forward. Crunchy skin, beautifully cooked inside. If all you want is plain salmon, this is it. I made this last night and it was good, quick and easy. Very simple way to get dinner on the table quick. You just gotta love the simplicity.